It’s easy to edit your activity. 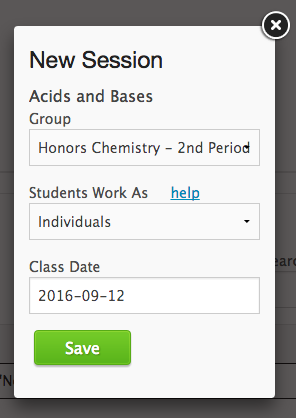 Please note that editing an activity will change that activity for all of the groups that it is assigned to. To edit an activity, select the button in the Activities tab. Here, you can activate a session and add a new prompt. To view the process of adding a new prompt, see Adding a New Prompt. To make an activity visible to a group, you will need to assign that particular activity to a group. There are two ways you can do this: directly from the activity’s page or from the Sessions tab in the Teacher Dashboard’s drop down menu. Here, you will learn how to activate a session from the activity’s page. To find instructions for the other way, see Creating a New Session. Click the button under Existing Sessions. Select the group you want to assign the activity to, whether students can work as individuals or in small groups, and the date you would like the session to activate using the drop down menus. The activity will not be visible to students until it is activated.